Okay so this really clean 1991 300D 2.5T popped up on CL as a $700 Mechanic's Special..PO said it wouldn't start after going to London for two months and was a great daily driver before that. I believed everything he said and ate it right up,$700 handed over and she was pulled up on the flat-bed of the AAA truck,done deal. Come to find out,the very next morning I charged up the very dead battery,and saw smoke pouring out of the passenger side under cranking..thought that was weird,also the starter was struggling to turn it over.. Well dam I thought,guess she needs a new starter.Threw a reman starter in and it is doing the same things the original was doing..Turns out the smoke was actually because the downpipe is completely disconnected where it runs under the car.. Okay,after I cracked a few of the fuel lines I saw it was getting fuel and still wouldn't start...I heard bubbling in the radiator,and decided to pop the reservoir tank open,and it bursted a mix of coolant and oil...Greeeeat I thought,I was greeted with this lovely sight. It gets worse,earlier in the day I decided to take the air intake inlet off the turbo and feel the shape of the turbo,because I find them interesting and what not.. What the heck,the turbo was seized! I hooked it up to a cordless drill via the 8mm nut on the front and started injecting Marvel's Mystery Oil into the feed part of the turbo..now it can be turned over by two fingers... I decided to check out the rest of the interior at this point and then I found two bottles of this in the rear cargo compartment..
Okay,so this $700 no-start great daily driver just turned into a big potential nightmare.. I need some advice guys, I can part the car out/crush it,and break even (in it $800 at this point),or I can pull the head off and see if this is savable.. I already ordered the M10 socket for the head-bolt removal,but just wanted to get some more advice.. In a little bit deeper than what I wanted to be,but I really do like this car.This could be the car for me to keep and get sorted..interior is basically perfect,A/C is cold(so said the PO),CC works,paints pretty good,etc but it does have ~240k miles on it..
Man I need to stop believing people,and getting burned on CL.. I always see the good in people,sigh. Thank you PP,I really appreciate it. Whats wrong with 20w50? It sounds like a blown headgasket to me. The headbolts are 12 point XZN. I was also wanting to hear from you guys,and see what the potential is for it to just be a bad HG,I checked the head #'s it does not have a 014 head,it has a 016 which is the first good thing I've seen all day. If it is just a bad HG that'd be amazing! The #14 head issue is found in the '87 300D and TD, not the 90-93 2.5. Head casting number is basically irrelevant since there is no substantial history of 602 head cracks. Add a vote for a bad head gasket. How's the turbo's axial and radial play? I hope it's good enough vs the $60 for the Hazet one. Play feels within spec for a 240k turbo,I hope it'll free up a bit more after running. Thank you already my mind is going to ease,I might be able to sleep tonight after all,lol. The wrong oil is not a kiss of death, just won't protect the engine as well long term. Did you try to negotiate the price of the not running car? $700 isn't horrible and depending on interior condition etc. you might do better than breaking even parting it. Funny thing is that these cars often run for ages with oil dumping into the coolant. If you can do that job yourself it's probably worth it. I did,he originally wanted $800 for it but had so much interest in the car he was pretty firm on the price. I didn't negotiate a whole lot because it looked so clean,like I said the interior is basically mint! I'm tired of driving beaters,this car is a serious step in the right direction (not too fancy or nice either which I love). Right,and the e-codes make the whole car in my opinion. I was going to pull the radiator out tomorrow and get all that crap out of there..great news about the oil,so this motor might just be fine after all! If anyone has any pointers or other things I should look at that'd be appreciated. And again I just want today thank you to the PP community, amazing resource this is! I recommend pulling the head, and having it tested. the 2.5T motors are fairly durable, but overheating will kill them dead. DO NOT ASK HOW I KNOW!!! some have pulled the valve cover, and retorqued the bolts IN THE CORRECT SEQUENCE!!! and staved off pulling the head. it's worth a try. the problem is the angles between the teeth on the tool. This is also used to undo toyota cylinder heads - and people on the internet complain that toyota tighten it too much - so much so that their "triple square" tool breaks. 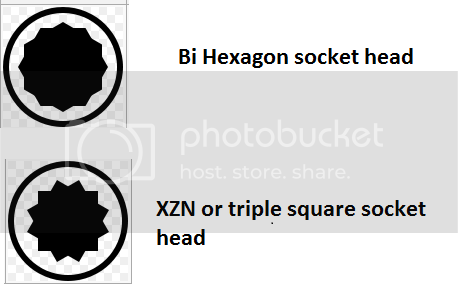 If you use a bi hex socket - it wont break . I bought mine from snap on - it was surprisingly cheap. - The snap on tool is short meaning you need to remove more stuff to access the bolt heads. I believe the old 61x engines had the XZN bolts. All the info I've seen has said that they're all XZN head-bolt's..
Can you show me some info that says otherwise please? Could be a nice car when sorted out. There is a history of OM602 head issues, however that IIRC was only the early 602s, and I'm not sure that it ever went past the '87 602 turbo. The FSM has the head casting numbers and history. Also, be sure that if you replace an OM602/603 head, you only use a turbo head on a turbo engine (different castings also, consult the FSM). Your car sounds like it might have some rusted cylinders from water/coolant sitting in them for a period of time. If you plan to keep the car, remove the head and check cylinder condition before you get much further. Also, if the turbo was seized, have it checked by a turbo shop, a seriously bad bearing/seal will let enough oil past the seal to run the car, and it won't shut down until it runs out of oil and destroys every moving part.